Affenpinschers first appeared in Germany in the 16th century. The name is derived from the German “Affe” which means monkey. The name of this breed arises from its interesting appearance and behavior. Sports instincts and strong character made these dogs very useful in a destruction of mice and rats. Nowadays, Affenpinschers are wonderful companion dogs. Affenpinschers are harmoniously composed and strong. They combine the enthusiasm and courage, boldness and charm. This breed is extremely smart and constantly surprises with its agility and dexterity. Gentleness and sensitivity adorn Affenpinscher`s nature, and yet, he is somewhat territorial when it comes to their toys and food. The Affenpinscher is very intelligent and inquisitive. He is affectionate and playful, mischievous and funny. They get along very well with other pets, but not with young children. If they perceive something or someone as a threat, they become aggressive and fearless to the imaginary enemy. 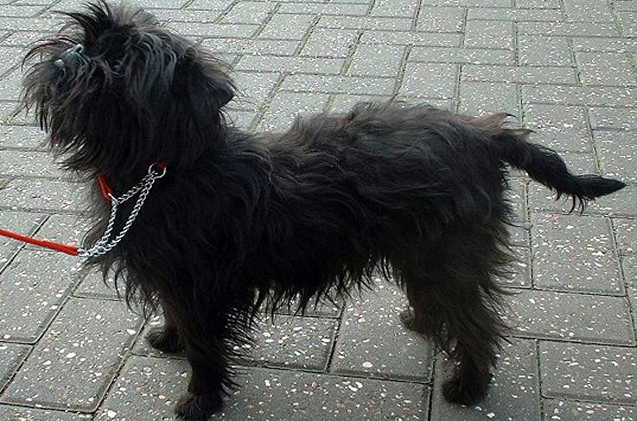 By nature, Affenpinscher loves to entertain and to be entertained and enjoys being near his family. Affenpinschers have a dense tangle of shaggy hair. Hard and rough, the hair is located on the entire length of the shoulders and back. Neck, chest, legs, stomach and head are covered with a less rigid layer of hair. Affenpinschers grow a so-called mane on the neck, also, eyebrows are thicker, and there is a small beard. The coat is a protection in extreme weather conditions, and the color can vary: from the black and silver to brown and red. The Affenpinscher allegedly do not shed, so this breed does not require daily combing, it is enough to pull out “stray” hairs that are growing (such as around the eyes to prevent irritation). Ultimately, Affenpinscher should not be cut short. These dogs are difficult to train. They require respectful owners who are able to demonstrate firmness and consistency during training. Affenpinschers are eager to learn, but do not like constant repetition of commands, they prefer exciting challenges that both educate and entertain. The Affenpinscher is very cheerful and energetic. These dogs are constantly on the move, and they enjoy long walks in the fresh air. Affenpinschers can play both indoors and outdoors, but the ideal environment is a small fenced yard, so the pets can run and burn some energy. Affenpinschers are small in size, but they love to bark and thus show that they are the real defenders.